Thread: Does NAD C315BEE and NAD C740 go together? It's actually two separate stereos but I thought it would be fun to make one stereo out of them. 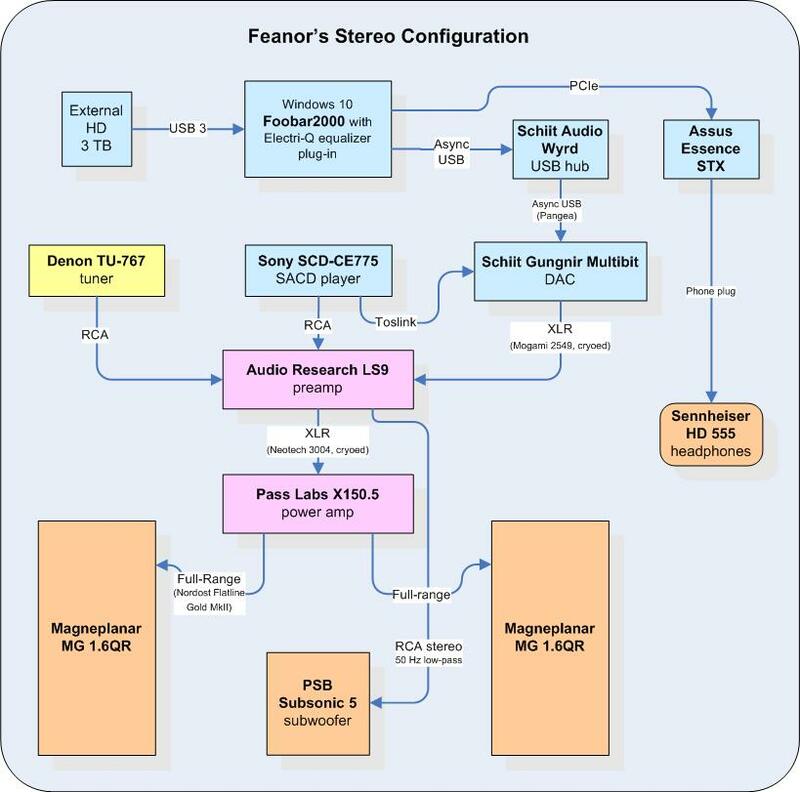 I don't really know much about audio stereos so i'm a bit puzzled by what I ended up with. The C740 reciever has inputs for 2 sets of speakers (which the C315BEE doesn't) so I tried hooking all of the speakers into the C740. It worked fine, and I got some nice sound out of the setup. On paper the C315BEE has more power than the reciever 40W continous in 8ohm compared to 35W for the C740, so I thought I might get "more" out of the system if i hooked them both together. So here is what I did. 1. Audio source goes into C315BEE. 2. C315BEE is then connected to the C740 reciever, with a phono cable from the "Tape out" on the C315BEE to "Main in" inlets on the C740. 3. All four speakers connected to the C740 reciever now plays very nice, maybe even better than before.. hard to tell. 1. Which of the amplifiers does the amplifying? both? 2. Why doesn't the nobs on the amplifiers work in this configuration? 3. Does the setup even make any sense? Hi, Johannes, and welcome to AR Forums. I see you could use some help. First, the C740 is powering both speakers; only its power section is actually driving speakers. Powering two non-identical speakers might give you more power but will cause other problems, basically an incoherent sound due to the same portions of the audio spectrum being played by two drivers in different locations -- which is to say not a good idea for the best sound. Secondly. the volume, balance, and tones won't work with your current connections because neither component can provide these controls. (1) Using the Tape Out on the C315BEE bypasses the controls and sends the selected source signal directly to the C740; (2) using the Main In on the C740, you are bypassing the C740's controls and sending the signal directly to its power section. You could connect the C315BEE's Tape Out, (it has not Pre Out), to one of the C740's source inputs; that would let you use the C740's control. However I would suggest you simply connect all your sources directly to the C740 and not use the C315BEE at all. Actually it might be better to just use the your two systems as two systems. Thanks for the reply! As I understand what you are saying I'm literally just using my C315BEE as a fancy extension cord, leading the audio signal unaltered straight through it. That does seem like a waste of the good old C315 It's a shame though that I can't use it to drive both speakers, as I prefer the sound from the C315 over the C740 when hooking up one speaker pair at the time, seems like it has considerably more room in the bottom. The setup with the four speakers hooked to the C740 does give some more "air" to the sound though, for lack of a better word, than the C315 with Dali speakers only. So I'll probably stick to the C740 with both speakers for now, and no weird cross wiring with the C315. Just think it's such a shame to let the C315 go unused..
Glad we could be of help. Enjoy!